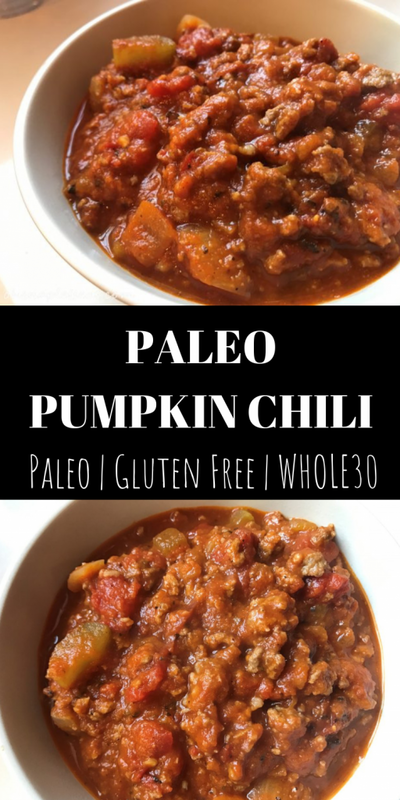 Easy and Delicious Paleo Pumpkin Chili - Oh Snap! Let's Eat! 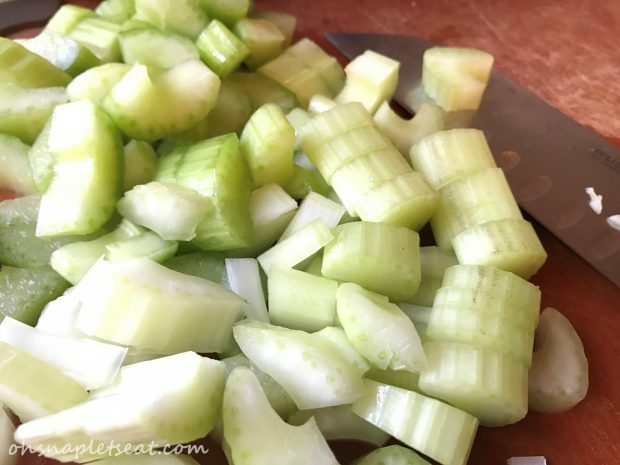 Dice your onions, and slice your celery, and mince your garlic if not already done. Heat butter or coconut oil in soup/stock pot in medium heat. 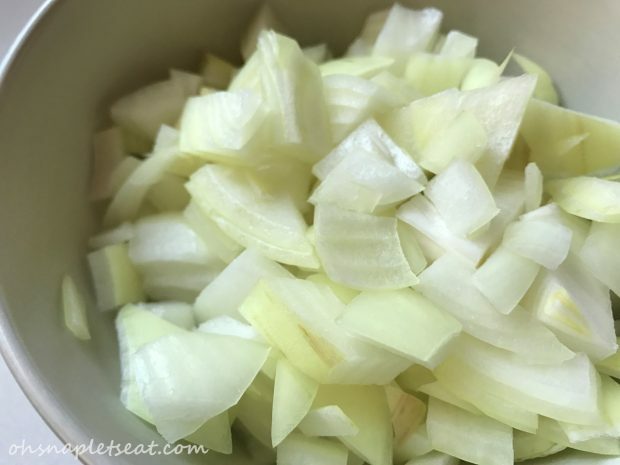 Add diced onion, celery and garlic, and sauté for a few minutes so that the onion and celery start to soften. Add pork sausage, ground beef to the pot and continue to sauté. 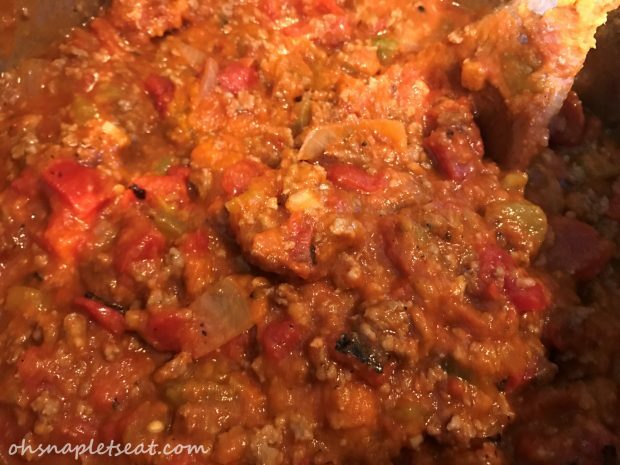 Once browned, add diced fire roasted tomatoes, pumpkin puree, green chiles, tomato paste, broth, and all the spices in to pot and mix well. Simmer for 20 minutes, mixing it occasionally. 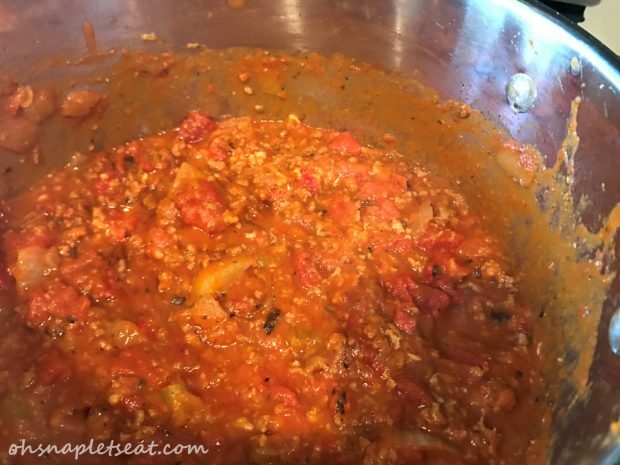 Once browned, add diced fire roasted tomatoes, pumpkin puree, green chiles, tomato paste, chicken broth, and all the spices in to pot and mix well. 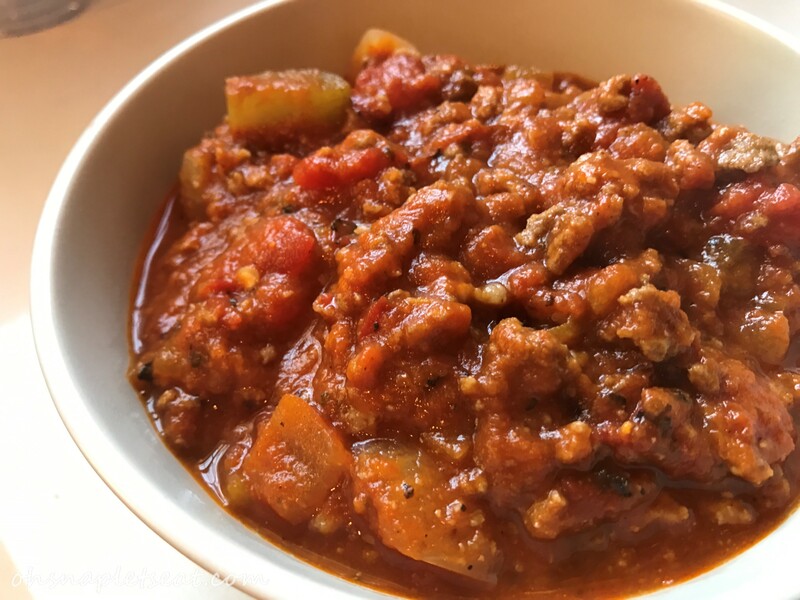 Looking for more paleo chili recipes? 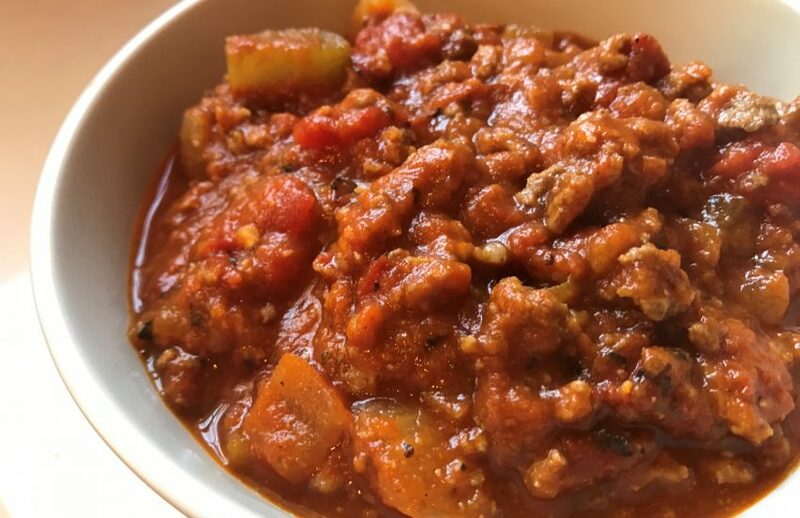 How about this one with a major kick: Spicy Paleo Slow Cooker Chili (without Chili Powder)! Pumpkin chili sounds great. Is it possible to substitute ground turkey for the beef. Hubby will absolutely not eat red meat. I haven’t tried that before but I definitely don’t see why not! Let me know how it turns out if you try it! 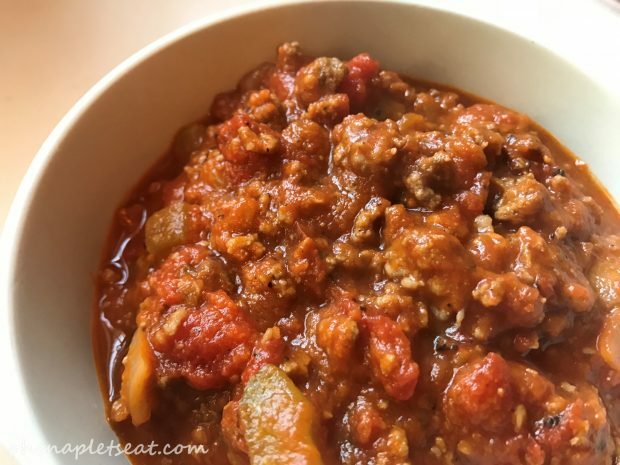 This has been my go-to chili recipe since I stumbled across it almost a year ago. Love it so much and it’s so thick and hearty with the added pumpkin puree. Thank you! Thank you for dropping by and letting me know! It’s one of my fave chili recipes as well! I’ve got a pumpkin sitting on my counter to roast and puree – this might be what I need to use it for! This looks delicious and hearty. You can never have too many chili recipes! I love pumpkin! I am definitely making this. Thank you! Everything about this chili sounds delicious, from the fire roasted tomatoes to the green chilis, and I just so happen to have a pumpkin waiting to be used up! Love pumpkin chili flavor. Sweet and savory all in one bite. YUM ! Look great!!! Love pumpkin chili! Yummy! Chili is a favorite in my home, especially this time of the year. I love the pumpkin addition in your version. I love pumpkin in chili. So good and hearty! Your pumpkin chili looks amazing! 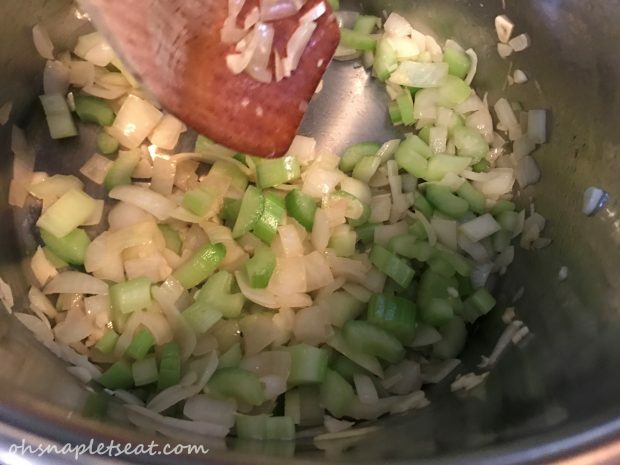 I never thought to add celery to chili but I see how it would kick it up a notch. This looks like the PERFECT fall time dinner. I love anything pumpkin. This looks so good! I’ve seen a few pumpkin chili recipes floating around, but I’ve never actually tried it myself. Your recipe looks delicious and easy!